The World War One Honor Roll is across the street from the larger and more well known Waikiki Natatorium. 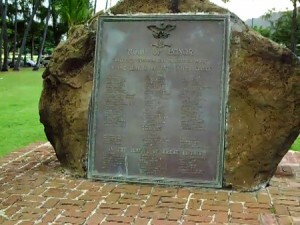 The massive stone recognizes the 101 Hawaiian Territory soldiers who served in World War I. Each hero’s name is etched in one of three columns on the marble stone. This monument reminds us of the bravery of these people who served for United States or British forces during the war. The Waikiki Natatorium and World War One Honor Roll are located at the east end of Waikiki Beach on Kalakaua Ave just east of Kapahulu Ave. When you visit, stop by the nearby Waikiki Aquarium and Honolulu Zoo.